These Epsom Derby Archives reveal past performances to help find the winner of the current renewal of the race. Sir Michael Stoute has withdrawn Telescope from the race citing sore shins. The unbeaten Dawn Approach is the likely favourite and has a good chance after winning the Group 1 2000 Guineas at Newmarket in May. Although it has to be said the 1m 4f trip of the Derby is a journey into the unknown, his sire won the race in 2008 and his relaxed style of racing suggests he would get the trip. His dosage figures however are a cause for concern as they show he has more speed than stamina in his pedigree. Those with good dosage figures for the race worth consideration are Mars, 6th in the 2000 Guineas, Kingsbarns, Ruler Of The World, Indian Chief. While those at bigger prices include Bravodino, Improvisation, Galileo Rock, Aashdan. Telescope heads the market for this most prestigious of all races and with good reason. With just two runs under his belt as a 2yo this might appear a little presumptuous so what is it that appeals to the market makers to rate his chances so highly? His first race was a maiden at Ascot over 7f on good to firm and this son of Galileo (who won this race in 2001) just failed by a short head through lack of full fitness. He made no mistake on his next race over 1m at Newmarket bolting up by 2 lengths and is sure to appreciate the step up to 1m 4f. Further cause for encouragement is the resurgence this year of his trainer Sir Michael Stoute who is showing a 24% strike rate with his 3yo’s and already amassed over £264,000 in prize money. Aidan O’Brien’s Dawn Approach would be a real threat if lining up as would Ruler of the World both of whom are unbeaten in their races this season. Telescope was due to make his first appearance of the season in the Dante at York but had to withdrawn after grazing his legs in the horsebox. However he impressed work watchers during a workout on the Limekilns at Newmarket on Sunday morning 19th May and connections are hopeful that he will line up for the Epsom Derby. Bookmakers reacted to the news with a general 6-1 quote - with a run. Arundel-based trainer, John Dunlop, knows a good horse when he sees one, and the ex-military man has always maintained that his Farhaan could develop into a smart performer. Despite finishing only fourth of five on his recent reappearance, it is not beyond the bounds of possibility that the veteran handler might let his colt take his chance at Epsom, on June 2 in the Investec Derby, writes Elliot Slater. Having his first outing as a three-year-old, when tackling the listed Fairway Stakes over 10 furlongs at HQ recently, the son of Jazil looked as though the run would bring him on, but he shaped well under Paul Hanagan. He took it up with two furlongs to run, and was only headed well inside the final furlong, before going under in a blanker finish to possible Derby contenders, Thought Worthy, and Frankel’s full brother, Noble Mission. Beaten just over a length, at a fitness disadvantage with the first two home, and possibly having hit the front plenty soon enough, there were enough positives to take out of this performance to believe that Farhaan would not be out of place in the line-up at Epsom. If he improves for the run, and goes on from the useful form he showed last term, when gaining many admirers with victories at Newmarket and Salisbury, and a fifth place at the Group 2 Royal Lodge Stakes, Sheik Hamdan al Maktoum’s three-year-old might just prove himself capable of running a big race in the blue riband contest. The Betfair horseracing tips, however, are dismissive of Farhaan’s chance, having priced him up at a general offer of 50/1, in a market totally dominated by the unbeaten 2000 Guineas winner, Camelot, a top priced 10/11 favourite. The Betfair Epsom Derby Festival website has all the information you need to bet successfully on the upcoming race, as well as the latest odds on Camelot, Farhaan, and Bonfire, among others. Carlton House suffered a set back in his preparations on Monday when he bruised a near-fore joint while training. Connections will decide on his participation on Friday. Fallon will also ride Oaks second favourite Wonder Of Wonders on Friday. French trainer Andre Fabre considers Epsom Derby 2nd favourite, Pour Moi, "the best chance I've ever had" to win the Epsom Investec Derby. The Prix Greffulhe winner tackled the unique curves and undulations of the Epsom track for the first time on Thursday and was said to have enjoyed the experience, pulling eight lengths clear of his stable companion. Pour Moi is a general 6-1 price although Boylesports is as short as 4-1. Kieron Fallon was also on the course giving Native Khan a spin over the last mile, drawing clear of his work companion by a half length at the finish. The Queen will no doubt be secretly pleased to learn that her horse Carlton House worked well on the Newmarket watered gallops on Thursday 26th May, pushing 12 lengths clear of his senior stable companion. The Investec Epsom Derby favourite has now been shortened by Stan James to 5-4 from 6-4 after the workout and his trainer, Sir Michael Stoute told Attheraces: "He seems in good shape and I’ve been happy with his preparation. We know he quickens and hope he'll stay the trip." 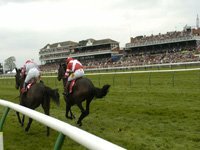 Although Carlton House was reluctant to enter the stalls when winning the Totesport Dante Stakes at York, his trainer has no concerns for a repeat performance as he had never shown signs of that before. Casamento, winner of the Racing Post Trophy in 2010, leads Godolphin's hopefuls in this year's Investec Derby. The Shamardal colt is also entered in the 2,000 Guineas although a decision is till to be made whether he will contest the Guineas or the Dante as their other contender, Dubai Prince is also entered in the Guineas. Contested by three-year-old colts and fillies over 1 mile 4 furlongs over the undulating Epsom downs, it is the ultimate test in endurance and speed. Epsom Derby Archives stand out stats: Saddlers Wells is the most successful sire of Oaks winners with 5 wins and also 2 wins in the classic race itself. The most successful dam is Urban Sea whose 3yo Sea The Stars won last year's Epsom Derby renewal.